Take 40% off your purchase at J.Crew using the code TOGETHER. Valid in stores and online through November 22, 2018 11:59PM ET. Refer to my review of the Chateau Parka here which is currently $219 after discounts. 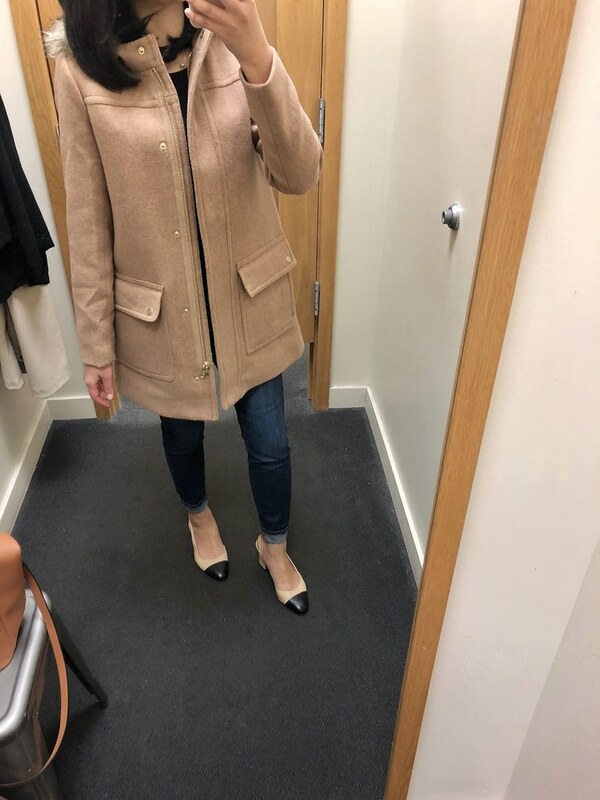 I have this jacket in dusty ginger from Holiday ’16 and in grey (below) from Holiday ’14. After wearing the grey color for a few seasons there is a tear in the inner lining where I sit down. I’ve noticed that the material also pills at the sleeves from the friction of swinging your arms back and forth and or where I carry my purse but you can use a fabric shaver to remove the pills easily. Check out my other J.Crew reviews here. If you don’t need a coat right away then you may want to wait until after the holidays to get it since various sizes and colors will pop back in the early AM restocks. I got the dusty ginger color for $173.99 last year but I remember I bought the grey color for only 25% off the very first season it came out in 2014. 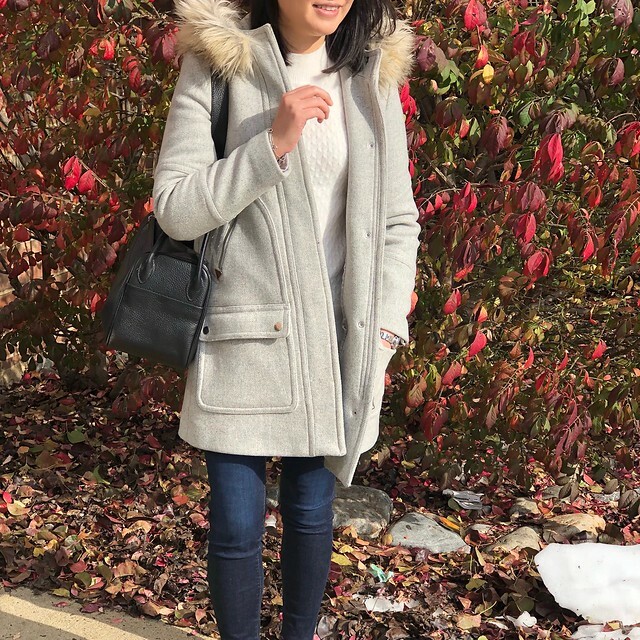 This parka style jacket is so popular that even Ann Taylor has a similar faux fur parka this season in both grey and black (I took the black color in my usual size 0P but more on that jacket in an upcoming post). Get 40-50% off everything at J.Crew Factory. Use code ADD2CART. Valid in stores and online through November 24, 2018 11:59PM ET. Meanwhile get 60% off everything in stores through November 25, 2018. Refer to my other J.Crew Factory reviews here. I like this heather saddle color which is a camel color in person. Size 00 fit me well it has 23.5″ sleeves and it’s 29.5″ total length. 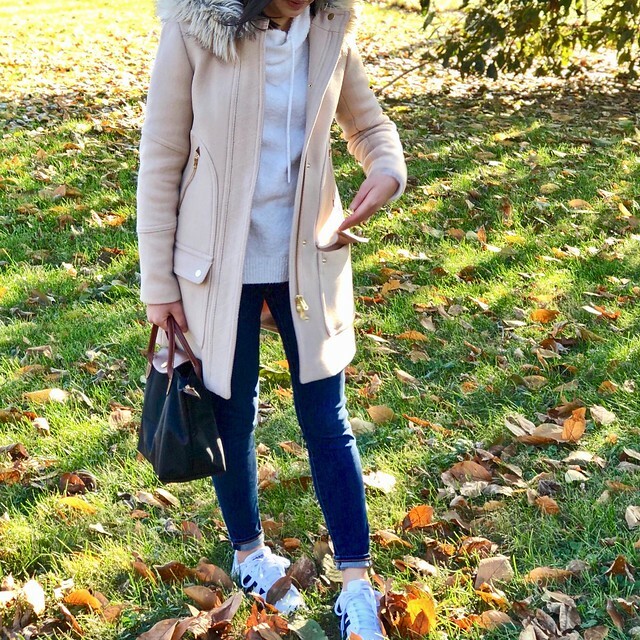 This is a mid weight swingy coat that’s perfect for layering underneath since it’s not particularly warm on its own. I also like the size of the faux fur hood and I prefer hoods over wearing hats which I would probably drop and lose in a hot second. Note that unlike the regular J.Crew version this factory version’s faux fur trim on the hood is not removable. I recently received a request to try on this Lodge jacket over the weekend and I first tired on size 0 regular but it wouldn’t zip up since the shoulders are narrow and the sleeves are snug. Size 2 regular fit me well with a sweater underneath. Note that I was wearing a dolman sleeve style poncho sweater which is difficult to wear under a coat comfortably since the extra material at the sleeves bunch up. For size comparison the body of this Lodge coat is still less roomy than size 00 of the Chateau parka that I was wearing that day over my outfit. for more updates until the next post. Update 11/21: I received a few of my orders early yesterday so you may see me upload new photos and video clips to my Flickr as I work on a new post. I finally got my hands on the grey version of the parka a few weeks ago, and am absolutely in love. 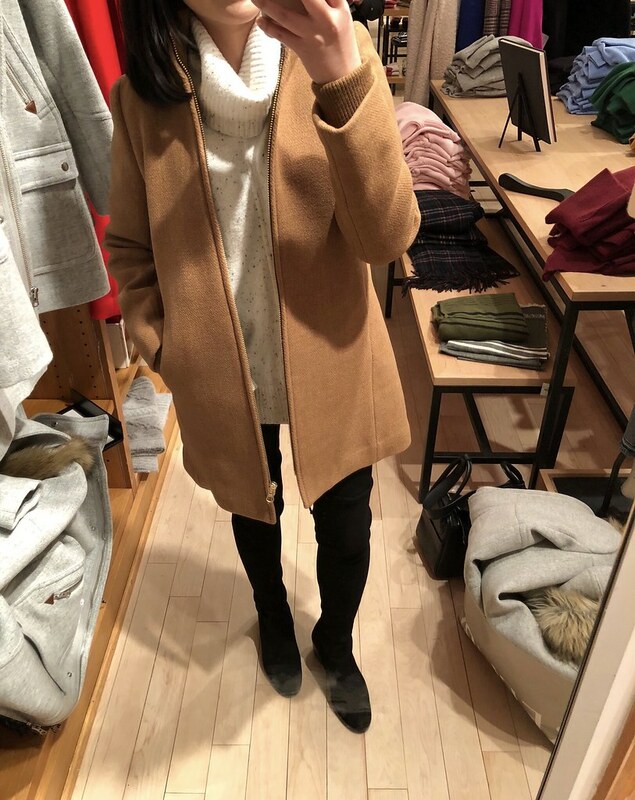 I have the black version from 2014 I think, and held off on buying the coat again until this year because I just felt like the quality was going downhill, but the price remained the same. I sprung for it again this year because the wool content is back up to 80% and the fabric feels much nicer. In spite of the decreased wool content in last year's version, do you feel your ginger coat has/will hold up as well as your grey version? @Leesooim I'm so happy to hear that! I checked both coats and they both have 79% wool despite being from different holiday seasons. My ginger coat is holding up well since I've worn it less due to getting it last January 2017. The lining is still in good condition too.